This beautiful villa looks set to smash the ceiling price for rental homes in Harrogate thanks to an exceptional, no-expense spared restoration fuelled by a long-held love for the property. The seven-year project began in 2011 when businessman Ian Townsend bought the building for his wife, Mandy, who had always admired it. “I bought it on the first day it came onto the market,” he says. Holderness House on Victoria Road dates to about 1850 and has views across The Stray. As the spa town’s popularity grew, what was a private home was extended and converted into The Stray Hotel. Requisitioned by the government during WWII, the building later became part of a series of private apartments known as Stray Towers. Mandy Townsend oversaw the work and the interior design on the 4,562 sq ft home and didn’t allow her husband to see it was complete. The original ceilings in the drawing room have been restored by specialists and early Victorian fireplaces were reinstated but the home also boasts 21st century amenities. “We agreed that it had to be one person’s vision and it’s amazing,” says Mr Townsend. The lower ground floor now has a 15-seat cinema, a bedroom suite, an en-suite bedroom, a laundry, butler’s kitchen and a plant room. A magnificent cantilevered stone staircase and a lift lead to the ground floor, which has a hall, reception room, drawing room, kitchen, bedroom suite and garden room. This connects to a loggia and terrace created by Chelsea award-winning designer Lizzie Tulip. 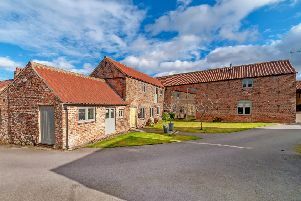 Holderness House, which features prominently in Ian Townsend’s historical novel “Precarious Fortunes”, has parking and a garage and was designed with retirement in mind so it can accommodate a live-in butler or carer. While they intended to move in and retire, the Townsends are hard at work after they and their family established a vineyard in Upper Dunsforth. “That’s why we have decided to let the house but we will move there one day,” says Mr Townsend.